I am so busy this week. It’s non-stop, every single day and night, culminating in Kaylee’s Sweet 16 Birthday Party Friday night. My to-do list would scare the sane. I have two cookbooks coming out in the next two months, a fiction book that has “something” not quite right plot-wise and is going to require just a gutting and story-boarding, party planning/food prep/cleaning, learning how to make cake-pops, meetings, volunteerism, and life. So, if you can’t hand a hungry person a bowl of soup and a chunk of bread, find someone hungry for The Way, The Truth, and The Life (John 14:6) and tell them about Jesus. Or, tell 100 people. 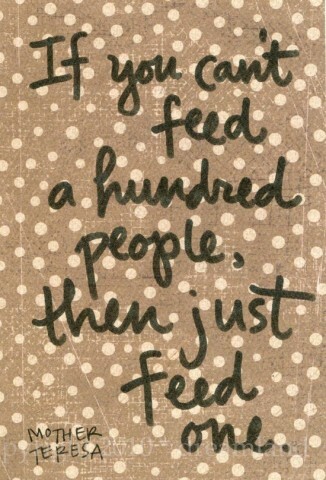 Or, feed 100 people. Go make a difference. I’m looking forward to trying it. Kaylee has a specific idea of what she wants – I just hope I can do it!